A slightly different feel from The Lone Tree and Seven Stones with strong flowing melodies, beautiful piano and soaring strings: A great new addition to Karen’s Seventh Wave collection. THE WELL OF SOULS Requiem is based in part on the classical form of Mass for the Dead. However, this work is not dedicated to any specific religion but to a wider honouring of spirit. Much of the inspiration for the essence of this music was drawn from the requiem of the French composer Maurice Durufl. He, along with Faur, broke the accepted pattern of previous requiems by evoking feelings of love and hope in our passing, instead of fear and judgement. 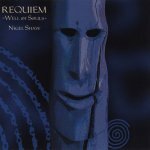 The Well of Souls Requiem is a personal interpretation of the journey through death yet this music is as much a celebration of life as a song for the dead. The literal translation of the Latin 'Requiem' is rest. Performed on piano and keyboards, wooden flutes, traditional whistles, and gentle percussion. Essentially instrumental with vocals performed by Carolyn Hillyer. Total album duration: 65 minutes. Subscribe to our newsletter to receive news, updates, and onother stuff by email. Your privacy and security are guaranteed. ©Copyright 2014 National Healing Energy. All Rights Reserved. Web Design By Blue Bee Solutions.